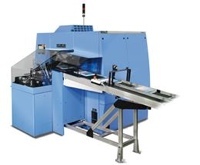 Operating at 4,500 cycles per hour with an 85mm trim thickness capacity—the highest in its performance class—the fully automated Solit Three-Knife Trimmer is designed to perform in both digital and medium-run offset production environments, making it a highly efficient trimming solution for today’s evolving print landscape. Print professionals can experience its unmatched performance first-hand at Muller Martini Booth #831 during Print 13. Fast set-ups. Since the trimmer can switch pressing plates and knife cassettes without the use of tools, and it features full automation from the infeed to the trimming center, changeovers happen in under three minutes—the shortest set-up time in its class. Consistently excellent trim quality. Like other Muller machines, the Solit features patented SmartPress Technology which helps ensure a perfect trim. Quiet and accessible. The Solit’s servo-controlled axis and robust, single piece frame provide for quiet runs, a short footprint and excellent accessibility. Investment protection. The Solit’s automation platform is designed to perform in both digital and offset production environments, making it not only a highly efficient trimming solution, but a sound investment for printers planning to cross over to digital manufacturing, as well. In addition, booth visitors will not only get to see the Solit perform at Print 13, but they can also take home a free personal journal trimmed on the Solit. Print 13 takes place September 8-12, 2013 at Chicago’s McCormick Place. Muller Martini’s theme at this year’s show is “Investment Protection. Make Ready for Change.” Muller’s engineers and product specialists will be on hand in Booth #831 to demonstrate manufacturing technology that’s been designed to grow as business grows, through components that add capabilities to accommodate dual production output.